A funny thing happened when I got back from overseas a couple of weeks ago. I checked my email and there was one from a journalist I worked with on a story for Successful Meetings. It had a link to the magazine and article online. I clicked it, and there it was… my gigantic self all over the cover! To be fair, I knew I was going to be on the cover, but I thought it would be a little box thingo somewhere in a corner. After all, I was only a contributor to a much larger article. I’m very flattered and more than a bit gobsmacked, and my mother is very proud, but holy dooley! The article itself is really good. Andrea Doyle did a great job on it, and the other contributors are smart and incisive. I am honoured to be a part of it and I hope readers find it useful. 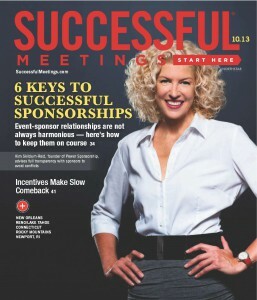 You can read the article in Successful Meetings – Oct 13 online. In related news, I’m actually on two covers this month. The second, Sporto Magazine, has me in some very good company in a photo much closer to what I thought the other one would be. Read it online by clicking the magazine cover. Yes, darling. They know I’m not really famous. Interested in having me contribute? I’m happy to contribute to credible industry publications. I am super-busy, so if you can give me some lead-time, that’s ideal. I’m also quite partial to conducting interviews via email, as it’s often easier to coordinate (time zones). Finally, please have a realistic topic in mind. Asking me to address the question, “How to successfully seek sponsorship” in 500 words does not qualify as “realistic”. The last time I tackled that whole topic was for the new, fourth edition of The Sponsorship Seeker’s Toolkit, and that topped out at over 76,000 words! Do drop me a line if you’d like to discuss a contribution to your publication and I’m sure we can work something out. I’d love to hear from you!